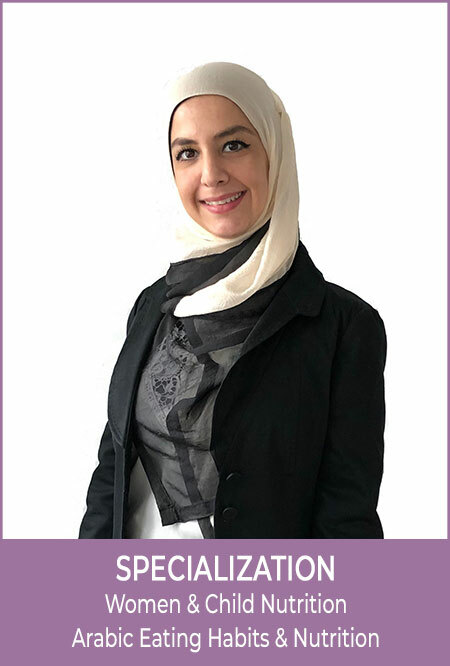 Aya is a registered Nutritionist, graduated from the University of Jordan with a BSc in Nutrition and Food Technology. Native Arabic speaker and fluent in English. She accumulated 10+ years of professional experience in the field of nutrition. Aya started her career at a reputable hospital in Jordan. After that she worked in specialized centers for nutrition and diet in Qatar where she nurtured her specialization in weight management. Nutritionist specialized in weight management & Arabic cuisine. 7 years ago she settled in Dubai and worked the last year as a nutritionist at Beyond Nutrition. Over the years Aya has achieved notable successes with her clients who dealt with various health issues such as obesity, diabetes, hypertension, renal disease, gout disease, underweight and PCOS. Her strength lies in her ability to present nutritional information in an easy way, and to show her clients how to make healthy choices without significant sacrifices. As an experienced Nutritionist born and raised in the Middle East she is particularly adept at incorporating social, cultural and medical considerations into her dietary advice and plans – and always with an artistic edge. Aya is only satisfied when her clients maintain their ideal weight in a happy and healthy manner.